Step 6 is not a popular one amongst recovering alcoholics and drug addicts. As with all the 12 Steps, Step 6 pushes the addict to another level of effort and self-discovery. However, this does not come without pain. Change is never easy. But the rewards are worth it! I think the key word in this step is “ready”. There is something to be said about being ready to do something. For example, if I am not ready to jump out of a two story building that is on fire, then I should be ready to die! There are some things that are not worth waiting for so, let’s get to stepping ladies and gentleman, here we go! The other key word in this step is God. Now I don’t mean that from a theological point of view. I mean the concept of a higher power. Remember that the entire 12 step system is based on the notion that the individual has failed in their efforts to kick the habit and therefore need a power greater than themselves to restore them to sanity. Along with Step 4, this step is a test of that earlier commitment made in Step 2 and 3. Many questions arise when confronted with this step. For example, when will my higher power remove my character defects? 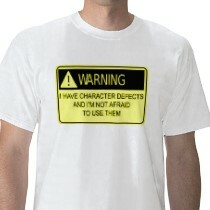 Another popular one is how will I survive without my character defects? Finally, my favorite is do I have to be ready to my higher power remove all of my character defects or just a few of them? As they say, ‘it only takes one excuse and any one will do”! Essentially, Step 6 is about asking your higher power to take away those personal traits, attributes, and characteristics that cause you to fail in interpersonal, work, and social situations. On the surface, it sounds like a great idea. However, when you look under the surface you see how much work is involved and the pain that goes with it. It is hard to give up impatience. It is painful to give up resentment. It hurts to let go of procrastination but in the end you’re only hurting yourself! You get my point. Finally, the important part to remember is that once character defects are removed, they are replaced with character assets! These are desirable qualities like love, joy, peace, patience, kindness, goodness, faithfulness, gentleness and self-control. These are the type of qualities that make people attractive on the inside. That attractiveness can’t help but overflow out into the world affecting all those who come into contact with this new creation of a person. Why would you want anything less?